The developmental functions of miR156-SPL regulatory network have been extensively studied in Arabidopsis, but the downstream genes regulated by each SPL have not been well characterized. In this study, Next Generation Sequencing-based transcriptome analysis was performed on roots of wild type (WT) and miR156 overexpression (miR156OE) plants. One of the SPL genes, SPL10, which represses lateral root growth in Arabidopsis, was significantly downregulated in miR156OE plants. A transcription factor, AGAMOUS-like MADS box protein 79 (AGL79), was also significantly downregulated in the miR156OE plants, but was upregulated in the SPL10 overexpression (SPL10OE) Arabidopsis plants. In addition, SPL10 was found to bind to the core consensus SPL binding sequences in AGL79 gene. Moreover, analyses of complementation lines revealed a linear relationship between SPL10 and AGL79 in regulating Arabidopsis plant development. In addition, it was observed that plant phenotypes are AGL79 dose-dependent, with higher expression causing narrow leaf shape, less number of leaves and early flowering time, whereas relatively lower AGL79 overexpression produce plants with more rosette leaves and more lateral branches. Our findings revealed direct binding of SPL10 to AGL79 promoter, which further suggests a role for miR156/SPL10 module in plant lateral root growth by directly regulating AGL79. MicroRNAs (miRNAs) are a class of non-coding RNAs with a length of 19–24 nucleotides that control gene expression at the posttranscriptional level (Bartel, 2004; Cuperus et al., 2011; Nozawa et al., 2012). Of all the miRNAs, miR156 is one of the most conserved in plants, where it regulates transition from the juvenile to the adult phase of vegetative development (Wu and Poethig, 2006; Chuck et al., 2007). 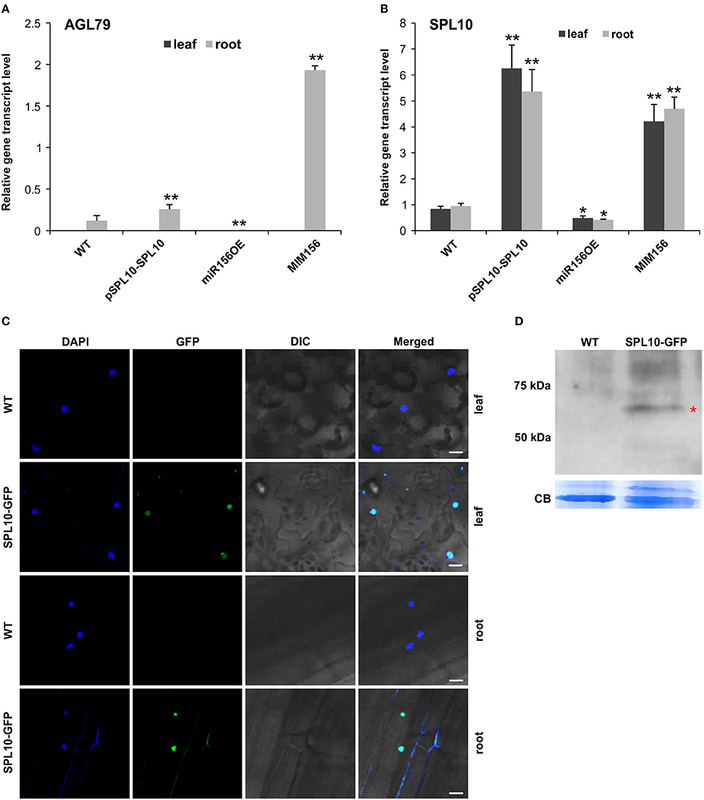 MiR156, which is expressed mainly at the early stages of shoot development, targets and represses the expression of the gene family SQUAMOSA PROMOTER BINDING PROTEIN-LIKE (SPL) (Rhoades et al., 2002; Schwab et al., 2005; Wu and Poethig, 2006; Gandikota et al., 2007; Wu et al., 2009). The SPL protein family members possess a conserved squamosa promoter binding protein (SBP) domain of 76 amino acids (Yamasaki et al., 2004; Preston and Hileman, 2013) that binds to a consensus DNA element with a core GTAC sequence (Birkenbihl et al., 2005; Liang et al., 2008; Wei et al., 2012). In Arabidopsis, 10 of 16 SPL genes are targeted by miR156 for silencing via transcript cleavage (Cardon et al., 1997; Rhoades et al., 2002; Schwab et al., 2006; Wu and Poethig, 2006; Xie et al., 2006). Based on the amino acid sequences of their conserved DNA binding domain, the 10 SPLs could be grouped into 5 clades; SPL3/SPL4/SPL5, SPL9/SPL15, SPL2/SPL10/SPL11, SPL6, and SP13A/B (Xie et al., 2006; Riese et al., 2007; Preston and Hileman, 2013). A genetic function study of each individual SPL gene in vegetative and reproductive phase development was also reported (Xu et al., 2016). Generally, based on this functional analysis, miR156-regulated SPL genes could be divided into three groups: (1) SPL2, SPL9, SPL10, SPL11, SPL13, and SPL15 play crucial roles in both juvenile-to-adult vegetative transition and vegetative-to-reproductive transition. (2) SPL3, SPL4, and SPL5 are involved in promoting the floral meristem identify transition. (3) SPL6 is predicted to participate in regulating some physiological processes, but its exact function is still not fully understood (Xu et al., 2016). Morphology of the plant root system is regulated by various factors, including numerous biotic and abiotic factors that make up the heterogeneous composition of the soil environment (Osmont et al., 2007) and soil matrix heterogeneity (Hodge, 2006), with the formation and growth of lateral roots being an important agronomic trait in plants (Yu et al., 2014). 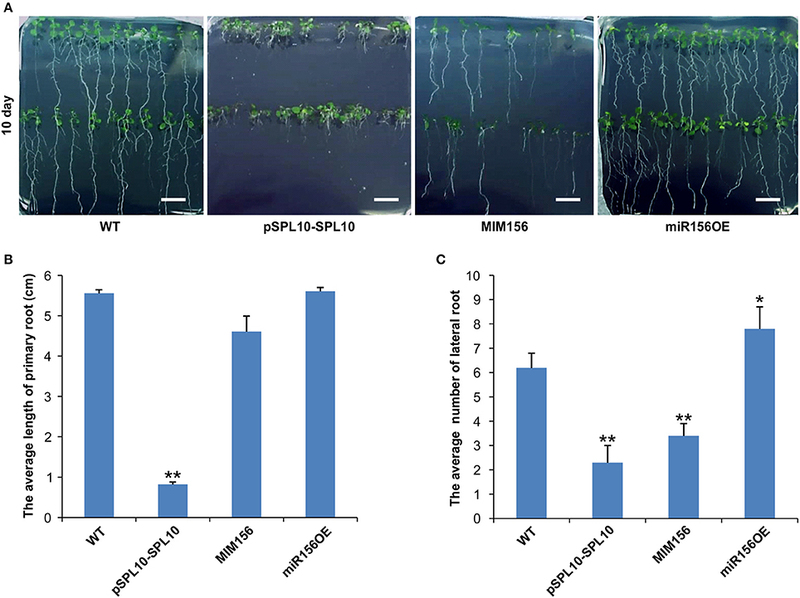 miR156-regulated SPL genes repressed the development of adventitious roots, for which production declined as plant growth progresses (Xu et al., 2016). Of all the known miR156 regulated SPL genes, only SPL3, SPL9, and SPL10 participated in the repression of lateral root development, with SPL10 playing a dominant role (Yu et al., 2015). In addition, SPL10, SPL11 and SPL2 redundantly controlled proper lateral organ development and shoot maturation in the reproductive phase, and ectopic expression of SPL10 also altered leaf lamina shapes (Shikata et al., 2009). Expression of the FRUITFULL (FUL) gene increased with shoot maturation, while its expression was also reduced in the cauline leaves of 35S:SPL10SRDX (a chimeric repressor) (Hiratsu et al., 2003) and increased in 35S:mSPL10/11/2 overexpression rosette leaves) (Shikata et al., 2009). These latter findings suggested that FUL may function in shoot maturation under the control of SPL proteins. In the leaf tissue, SPL2 controlled floral organ development and plant fertility by activating AS2 (Wang et al., 2016). MADS-box proteins are a family of transcription factors that are defined by their primary sequences, which encompass a conserved MADS-box motif; a 56-amino-acid region within the DNA-binding domain (Shore and Sharrocks, 1995). The majority of MADS-box proteins bind similar DNA elements with the consensus sequence CC(A/T)6GG, and several MADS-box proteins interact with other transcription factors to form multi-component regulatory complexes (Shore and Sharrocks, 1995). In plants, the MADS-box proteins are crucial for floral organ development and flowering time (Saedler and Huijser, 1993; Ma, 1994; Weigel and Meyerowitz, 1994). Specifically, SEPALLATA (SEP)-MADS-box subfamily factors are required for floral organ and meristem identity (Zahn et al., 2005). Another MADS box gene FLORAL BINDING PROTEIN 2 (FBP2) is required for SEP function in Petunia, and FBP2 plays a similar role to that of SEP3 in Arabidopsis (Ferrario et al., 2003). LEAFY (LFY) and APETALA1 (AP1) promote floral development not only by positively regulating genes activated in flower development, but also by repressing AGAMOUS-LIKE (AGL24), a promoter of inflorescence fate (Yu et al., 2004). These findings suggest that known functions of MADS-box proteins are mainly related to floral development. Although SPL genes have been extensively studied in Arabidopsis aerial tissues, the regulatory pathways involving miR156, SPL and downstream SPL-regulated genes have not been thoroughly investigated and characterized in root tissues. To further study the underlying mechanisms of miR156-SPL10 network in Arabidopsis, we carried out RNA-Seq based transcriptome analysis on the root tissue of WT and miR156OE plants, to identify and characterize potential downstream genes that are downregulated by SPL10. The analysis provided an insight into the role of miR156-SPL10 network in regulating lateral root development and vegetative branching. All of the Arabidopsis stocks used in this study were developed in a Columbia (Col) genetic background. The mutant plants spl2 (SALK_022235), spl10 (SALK_122018) and spl11 (SALK_112209), SPL10 overexpression lines (6mSPL10 and pSPL10-SPL10-GFP) (Nodine and Bartel, 2010), MIM156 seeds (Franco-Zorrilla et al., 2007) were obtained from the Arabidopsis Biological Resource Center (Ohio State University, Columbus, OH). Seeds of the 35S:miR156 were kindly provided by Dr. Detlef Weifel (Wang et al., 2008, 2009). All the Arabidopsis seeds were incubated at 4°C for 3 days in the dark for stratification, and then transferred to a growth room with long day conditions (16 h light, 8 h dark) and set at 23°C, 70% humidity, and a light intensity of 130–150 μmol/m2/s. Plasmid constructs were transformed individually into Arabidopsis ecotype Col-0 using the floral dip method (Zhang et al., 2006). To generate CRISPR-Cas9 constructs for AGL79 mutagenesis, the commercial CRISPR/Cas9 vector (pZG23C05) (ZGene Biotech Inc) was used following the manufacturer's instructions. The required single guide RNAs were designed using the web-based tool CRISPR-P (http://cbi.hzau.edu.cn/cgi-bin/CRISPR) (Lei et al., 2014). According to the sgRNA rating scores, two sgRNAs which possessed the highest scores were selected for further construct generation (Supplementary Document 2). For each target locus, a pair of DNA oligos (18–20 bp) were synthesized and annealed to generate dimers. These dimers were then ligated downstream of the sgRNA scaffolds in the plasmid vector pZG23C04, which expresses both Cas9 and sgRNA. For screening and verifying the genomic DNA sequences with putative editing events, PCR products spanning the sgRNA location site were PCR-amplified using primers CRPAtAGL79sg1F and CRPAtAGL79sg1R, and CRPAtAGL79sg2F and CRPAtAGL79sg2R (Supplementary Table 2). Amplicons were purified using a gel purification kit (Qiagen, Toronto, ON, Canada) and cloned into a pJET1.2/blunt cloning vector (Fermentas, Ottawa, ON, Canada). The positive PCR products were subjected to sequencing using a pJET1.2/blunt sequencing primer (Fermentas, Ottawa, ON, Canada). RNA was extracted from the roots of both WT and 35S:miR156 Arabidopsis plants that were at the 20-day post germination stage. Four biological replicates (independent RNA preparations) were used for each genotype. NGS of the root RNA was performed by PlantBiosis (University of Lethbridge, Canada) under a fee-for-service contract. Using the Arabidopsis genome (TAIR10, http://www.arabidopsis.org/) as a reference, differential gene expression analysis was carried out based on published protocols (Trapnell et al., 2012). Briefly, raw sequencing data were first evaluated with the FastQC program. All filtered and properly paired reads were then mapped to the Arabidopsis genome using TopHat. The fragment alignments generated by TopHat were then used as input files to be further analyzed through the recommended Cufflinks packages to detect the differentially expressed genes between WT and 35S:miR156 Arabidopsis plants. Plant tissues were collected at specific time points as indicated in results for gene expression analysis. Total RNA was extracted using TRIzol reagent (Invitrogen) and 1 μg was used to generate cDNAs through reverse transcription, using oligo(dT)15 or gene specific reverse primers with a SuperScript® III Reverse Transcriptase kit (Invitrogen™. Expression levels of the selected transcripts were analyzed via qRT-PCR in a total volume of 10 μl and carried out in a 96-well plate on the CX96™ Real-Time PCR Detection System (Bio-Rad, California, United States). Each reaction consisted of 2 μl of cDNA template, 0.4 μl each of both gene-specific forward and reverse primers (10 μM) (Supplementary Table 2), and topped up to 10 μl with water. CBP20 and Tubulin genes were used as internal controls for all qRT-PCR in Arabidopsis (Supplementary Table 2). Each test consisted of three biological sample repeats and each biological sample contained two technical replicates. Finally, transcript levels of the respective genes were analyzed using a relative quantification 2−ΔCt method (Livak and Schmittgen, 2001). Leaves from WT and SPL10-GFP transgenic Arabidopsis plants were used as materials for ChIP assays, which were performed according to a previously described protocol using the Chromatin Immunoprecipitation Assay kit (Lot:2382621, Millipore, Billerica, MS, United States) (Gendrel et al., 2005). Briefly, nuclei were isolated from leaves that were cross-linked with 1% formaldehyde under vacuum for 20–30 min and ground in liquid nitrogen. The chromatin solution was then sonicated 3 × 15 s into 500–1,000 bp fragments using a Sonic Dismembrator (Fisher Scientific, Hampton, New Hampshire, United States) set at power 3. Chromatin complexes were incubated with an anti-GFP antibody (Abcam, Cambridge, United Kingdom), and immune complexes were precipitated using Protein A beads. The precipitated DNA was purified and dissolved in water for further qPCR analysis using primers qnAtAGL79 as listed in Supplementary Table 2. SPL10 occupancy on AGL79 was estimated by comparing the percentage of input (%input) in pSPL10-SPL10-GFP and WT plants (Yamaguchi et al., 2009). The consensus sequence “GTAC” was identified as the core binding motif of SPL proteins (Klein et al., 1996; Birkenbihl et al., 2005). Primers flanking the SPL10 binding core motif GTAC in the promoter region of AGL79 were used to test for SPL10 occupancy. A DNA fragment containing a SBP binding consensus was amplified from an EIF4A1 gene (Shuai et al., 2002) to serve as a negative control. All the primers used for ChIP-qPCR are listed in Supplementary Table 2. Fresh Arabidopsis leaves (0.1 g) were homogenized in 0.2 ml of protein extraction buffer (0.125 mM Tris, pH6.8, 4% w/v SDS, 18% glycerol, 0.024% w/v bromophenol-blue, 1.43 M β-mercaptoethanol, 0.2% protease inhibitor). After boiling for 10 min, the insoluble fraction was removed by centrifugation, and the supernatant (denatured protein) was separated on a 12% SDS PAGE gel and transferred onto a nitrocellulose membrane, followed by incubation with primary anti-GFP antibody (Abcam, ab290, Cambridge, MA, USA) and secondary goat anti-rabbit IgG HRP (Abcam) antibody. The membrane was developed with Pierce ECL Western Blotting Substrate (Thermo Fisher Scientific, Waltham, MA, USA). The expression of SPL10-GFP fusion protein was also investigated using a Biological Confocal Laser Scanning Microscope FV10-ASW, and the emission wavelength for GFP and DAPI channels are 488 nm and 405 nm, respectively (OLYMPUS, Tokyo, Japan). SPL10 was reported earlier to play a dominant role in repressing lateral root development (Yu et al., 2015), so we investigated the root phenotypes in WT, pSPL10-SPL10-GFP (SPL10 overexpression under native promoter), miR156OE (miR156 overexpression) and MIM156 (miR156 repression) plants. As early as 10 days after seed germination, some differences could be observed among different Arabidopsis lines. Compared to WT plants, roots of pSPL10-SPL10-GFP plants were shorter with no obvious primary roots (Figures 1A,B), and have fewer lateral root branches (Figures 1A,C). MIM156 plants (where miR156 gene transcripts were suppressed) also had less lateral roots (Figures 1A,C). In contrast, the miR156OE plants showed relatively more lateral roots compared to WT control (Figures 1A,C). These results showed that the expression level of SPL10 is negatively correlated to root development in Arabidopsis. Figure 1. Effect of miR156 and SPL10 on root length. (A) Root morphology comparisons in WT, pSPL10-SPL10, MIM156 and miR156OE plants at 10 days after seed germination (bar = 1.2 cm). (B) The average length of the primary root and (C) the average number of lateral root among different tested genotypes. The primary root length and lateral root branch number were investigated in three independent experiments and each experiment consisted of three plates for each genotype (each plate consisted of approximately 20 plants). ** and * represent significant differences relative to wild type using t-test at p < 0.01 and p < 0.05, respectively. In order to further identify genes that are involved in the miR156-SPL regulatory network in Arabidopsis, Next Generation Sequencing (NGS)-based transcriptome analysis was carried out on the root tissues of WT and miR156OE Arabidopsis plants. This analysis revealed a range of differentially expressed genes (DEG) between WT and miR156OE roots (Supplementary Table 1). Among all 10 miR156-targeted SPL genes, only SPL10 and its homolog SPL2 were significantly downregulated. Furthermore, a root gene encoding an uncharacterized transcription factor, AGL79 (AT3G30260), was also significantly downregulated with the most prominent fold change (−5.59). Further expression analysis of AGL79 revealed that it was nearly undetectable in leaf tissues of all Arabidopsis lines (WT, pSPL10-SPL10, miR156OE, and MIM156) (Figure 2A). This low leaf expression of AGL79 is consistent with previous reports (Parenicova et al., 2003). Figure 2. Detection of SPL10-GFP fusion protein from pSPL10-SPL10-GFP transgenic plants. Gene transcript level analysis of (A) AGL79 and (B) SPL10 in different genotypes (WT, pSPL10-SPL10, miR156OE and MIM156) of Arabidopsis. SPL10-GFP fusion protein was detected using both (C) confocal microscope (bar = 2.5 μm) and (D) western blot analysis with GFP as primary antibody. DIC: differential interference contrast; CB: Coomassie Blue Staining as loading control. ** and * represent significant differences relative to wild type using t-test at p < 0.01 and p < 0.05, respectively. AGL79 gene expression was initially characterized by us in several different Arabidopsis genotypes (WT, pSPL10-SPL10, miR156OE, and MIM156). In roots, AGL79 levels were the highest in MIM156, followed by lower expression levels in pSPL10-SPL10-GFP and even lower levels in WT and miR156OE (Figure 2A). The transcript level of SPL10 was also investigated in the above-mentioned genotypes. SPL10 transcript was detected in both the leaf and root tissues (Figure 2B), and was highly expressed in both tissues of pSPL10-SPL10 and MIM156 plants, with much lower transcript levels in WT and miR156OE (Figure 2B). This expression trend is somewhat similar to that of AGL79 (Figure 2A). The correlation between expression levels of SPL10 and AGL79 suggests that AGL79 may be regulated by SPL10 through the miR156-SPL regulatory pathway. As the afore-mentioned expression patterns suggested that AGL79 might be regulated by SPL10, further characterization was carried out using ChIP-qPCR to determine if AGL79 is a direct target of SPL10. For that, we characterized transgenic plants expressing the SPL10-GFP fusion protein (pSPL10-SPL10-GFP). Since SPL10 is a known transcription factor, we confirmed its nuclear localization in both the leaf and root tissues using confocal microscopy (Figure 2C). In addition, the SPL10-GFP fusion protein was also detected using western blot analysis (Figure 2D). The upstream promoter region (2000 bp) of Arabidopsis AGL79 revealed 4 core GTAC sequences that are distributed in three regions (I, II, and III), with all three regions possessing the typical NNGTACR SPL binding consensus (where N = any nucleotide, R = A or G) (Figure 3A, Supplementary Document 1). Strong binding capacity of SPL10 to regions I, II and III was detected by ChIP-qPCR in the pSPL10-SPL10-GFP transgenic Arabidopsis plants (Figures 3B–D). Compared to the WT control, occupancy in these three regions was substantially higher than that in the negative control eukaryotic translation initiation factor 4A1 (EIF4A1) (Figure 3E). Of the three putative SPL binding regions, region III showed a higher binding capacity (Figure 3D). These results show that the SPL10 protein could bind to multiple regions in the AGL79 promoter. Therefore, AGL79 appears to be regulated through the miR156-SPL network to affect plant development in Arabidopsis. Figure 3. Detection of SPL10 binding AGL79 by CHIP-qPCR. (A) Schematic representation of the promoter region of AGL79; asterisks indicate the locations of putative SPL binding sites in the AGL79 promoter, and numbers in brackets indicate the relative position of binding sites to the translation start codon of AGL79. Roman numerals indicate the sites were tested by qPCR. (B) ChIP-qPCR enrichment of putative SPL binding sites I, II, III and negative control (–ve) EIF4A1 relative to WT (set at 1). Each ChIP-qPCR histogram indicates the mean ± standard error of the results of four biological replicates. Enrichment values were normalized to DNA input. To further investigate the role of AGL79 in Arabidopsis development, we generated transgenic plants with either enhanced or silenced expression of AGL79. AGL79 overexpression Arabidopsis plants (Group 1, see next paragraph), on the other hand, had fewer and smaller rosette leaves, as well as earlier flowering time compared to WT plants at the same developmental stage [Figure 4B, 5B (WT and Group 1)]. SPL10 overexpression plants (6mSPL10) also showed a phenotype similar to that of AGL79OE (Group 1) plants (fewer and smaller rosette leaves) (Figure 4C, Supplementary Figure 2). 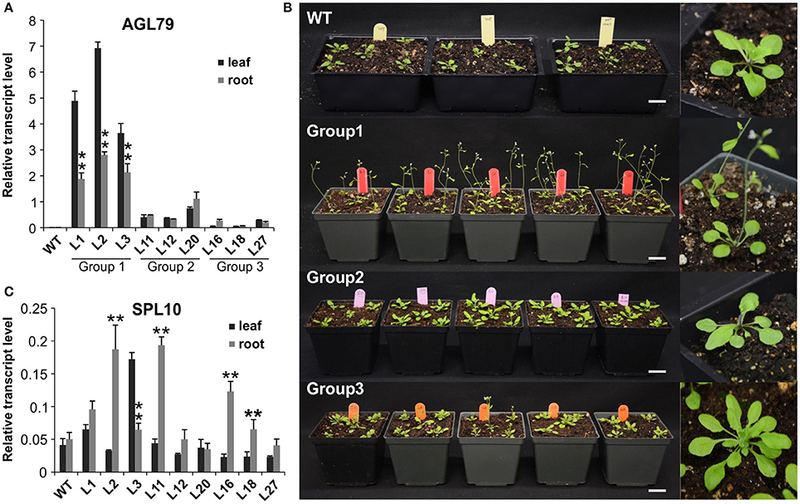 The phenotypical similarities between AGL79OE and 6mSPL10 plants suggest a potential linear regulatory relationship between AGL79 and SPL10. CRISPR-Cas9 was used to generate mutations in AGL79. Mutated plants were analyzed by Sanger sequencing, which detected mutations or deletions within the 20 bp sgRNA2 sequence regions (Supplementary Figure 1B), resulting in reduced gene expression (Supplementary Figure 1C). A phenotypic comparison between the four lines was carried out when the WT plants reached the bolting stage. Compared to WT (Figure 4A), CRISPR-Cas9-AGL79 mutant plants had more lateral shoot branches (Figure 4D, Supplementary Figure 1A). Figure 4. Phenotypic characterization of AGL79 misexpression Arabidopsis plants. All the used plants were grown at the same time and conditions, and the comparisons were carried out when WT reached the bolting stager. (A) WT plants. (B) Arabidopsis plants with highest AGL79 gene over expression (OE). (C) Phenotypic display of SPL10 overexpression line (6mSPL10). (D) CRISPR-mediated AGL79 gene knockdown (KD) Arabidopsis plant (bar = 1.1 cm). Figure 5. Comparison of Arabidopsis phenotypes with different AGL79 expression levels. 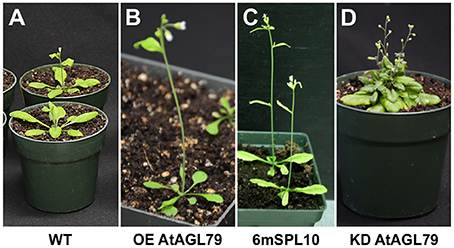 (A) AGL79 gene expression in different groups of transgenic Arabidopsis plants. (B) Phenotype comparison of WT and different groups of AGL79 overexpression plants (bar = 3.5 cm). (C) Transcript levels of SPL10 gene in different groups of AGL79 overexpression plants. ** represents significant downregulation in the root tissue relative to leaf tissue using t-test at p < 0.05. Transgenic Arabidopsis plants harboring the AGL79 overexpression construct were divided into three groups depending on AGL79 expression. Group 1 (lines L1, L2, and L3) had the highest AGL79 transcript levels in both the leaf and root tissues (Figure 5A), with lower expression in roots relative to leaves. Group 2 (lines L11, L12, and L20) had intermediate AGL79 expression, with variable expression levels between leaf and root (Figure 5A). Group 3 (lines L16, L18, and L27) displayed the lowest AGL79 gene transcripts, and there were no obvious differences in AGL79 transcript levels between the leaf and root (Figure 5A). Different phenotypes could be observed in these AGL79 overexpression plants depending on AGL79 expression levels (Figure 5B). Compared to WT (3 weeks after seed germination), Group 1 plants displayed fewer rosette leaves and early flowering time (Figure 5B). Group 2 plants displayed a phenotype similar to WT (Figure 5B). Group 3 plants showed more lateral shoot branches and a higher number of rosette leaves, as well as a significant delay in flowering (Figure 5B). In addition, the transcript level of SPL10 gene was also investigated in both the leaves and roots of the above-mentioned plants. Although changes in SPL10 expression could be detected in three groups of AGL79OE plants (Figure 5C), these changes did not follow any consistent trend, as found for AGL79 (Figure 5C), suggesting that AGL79 could be a downstream gene regulated by SPL10, and hence fluctuations in AGL79 expression would not affect the expression of the upstream SPL10 gene. Our preliminary analyses revealed that AGL79 knock down (AGL79KD) mutants had an enhanced shoot branching phenotype (Figure 4B). We further characterized AGL79KD mutant lines (KDL1, KDL3, and KDL5) relative to WT and 6mSPL10. Seeds were germinated on MS media and seedlings were analyzed after 14 days. Compared to WT, 6mSPL10 plants displayed fewer lateral root branches, whereas KDL1, KDL3 and KDL5 had more lateral roots (Figure 6A). The phenotypic comparisons were further carried out among the above-mentioned plants at 21 days after germination, with 13 plants having been analyzed for each plant line. Compared to the other genotypes, 6mSPL10 plants displayed the least number of rosette leaves and the earliest flowering time. In contrast, the AGL79 KD mutants had the most number of rosette leaves and the most delayed flowering (Figure 6B). When numbers of rosette leaves were compared to those of WT (average number of 9), AGL79KD averaged 14 and 6mSPL10 averaged 4 (Figure 6C). Figure 6. Morphological characterization of Arabidopsis plants with mutated AGL79. (A) Root morphology of AtAGL79 KD mutant at 14 days post germination. (B,C) Vegetative growth comparisons between WT, 6mSPL10 and three lines of AGL79KD mutant. Bar = 1.6 cm. Rosette leaves are shown from old (left) to young (right). Given the increased number of rosette leaves and lateral branches observed in the AGL79KD mutant plants (Figure 6, Supplementary Figure 1A), expression of genes related to plant vegetative branching and flowering time were analyzed in the three sets of plants (Figure 7). Consistent with the highly branched phenotypes observed in the AGL79KD mutants, the shoot branching-related CCD8 gene was significantly downregulated in the three AGL79KD lines (Figure 7A). Furthermore, given the hastened flowering time in the AGL79KD lines, several flowering time-related genes, including SOC1 and AGL24 were investigated in this study. Compared to WT, AGL79KD showed reduced expression of SOC1 gene (Figures 7B,C), with enhanced expression of AGL24 (Figure 7D). Figure 7. Expression analysis of flowering-related genes in AGL79 KD mutant. (A) CCD8, (B) SOC1, (C) AGL24. ** and * represent significant differences relative to wild type using t-test at p < 0.01 and p < 0.05, respectively. As all the evidence derived from molecular and biological analysis (Figures 2A,B, 4C,D) revealed that AGL79 is likely regulated through the miR156-SPL pathway, we investigated whether a linear regulatory relationship exists between SPL10 and AGL79. Crossing the AGL79KD mutant and 6mSPL10 produced F1 progeny with phenotypes similar to that of WT (Figure 8A). Similarly, crossing AGL79OE plants and spl2spl10 double mutant produced F1 progeny showing WT-like phenotype (Figure 8B). The selected genotyping results of the double mutant (spl2spl10) and AGL79 OE plants are shown in Supplementary Figure 3. These results suggest a direct linear relationship between AGL79 and SPL10 genes. Figure 8. Complementary experiments to investigate relationship between AGL79 and SPL10. WT phenotype was observed when crossing (A) AGL79KD mutant with 6mSPL10 overexpression Arabidopsis and (B) AGL79 overexpression plant and spl2spl10 double mutant. Bar = 1.5 cm. In this study, NGS-based transcriptome analysis of root tissues revealed that both SPL10 and AGL79 were downregulated in miR156OE plants. 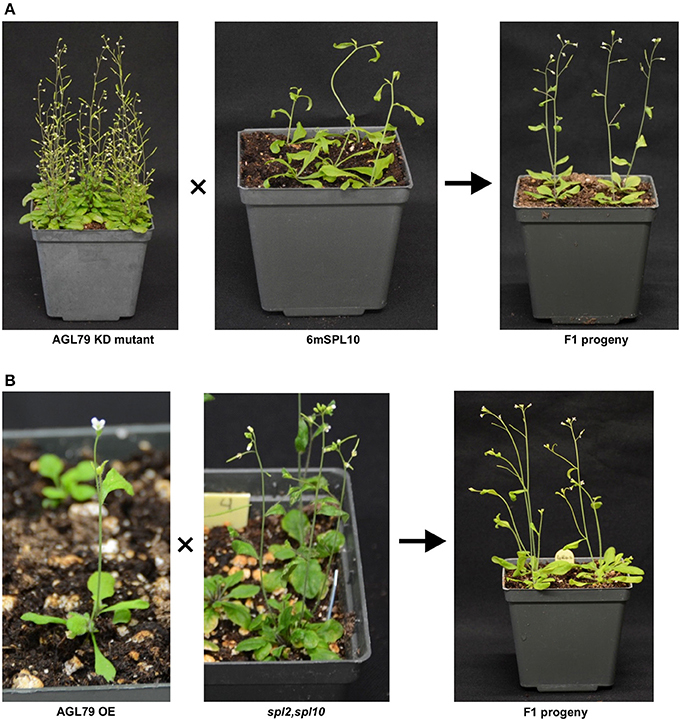 Further analysis revealed that AGL79 is under the regulation of SPL10 and is involved in various aspects of Arabidopsis development, including branching of roots and shoots, as well as flowering. The discovery that AGL79 is regulated by SPL10 may provide insight into how the latter regulates lateral root development in Arabidopsis (Yu et al., 2015). Currently lateral root formation in Arabidopsis is known to be regulated by two related AUXIN RESPONSE FACTORS (ARF7 and ARF19) via direct activation of LATERAL ORGAN BOUNDARIES DOMAIN and ASYMMETRIC LEAVES-LIKE (LBD/ASLs) (Okushima et al., 2007). In addition, lateral root formation in Arabidopsis is also redundantly regulated by cytokinin biosynthesis genes IPT3 and IPT5 and all three cytokinin histidine kinase receptor genes (AHK2, AHK3, and CRE1/AHK4) (Chang et al., 2013). The plant hormones (auxin, cytokinins, gibberellins, abscisic acid, ethylene, jasmonic acid, strigolactones, brassinosteroids, and salicylic acid) also regulate normal root growth and mediate root morphological responses to abiotic stress (Chang et al., 2013). Morphological analysis of Arabidopsis plants with enhanced and reduced expression of AGL79 revealed AGL79 to be involved in controlling shoot branching. CCD7 and CCD8 genes (also known as Max3 and Max4), are negative regulators of shoot branching (Rameau et al., 2014). The MAX-dependent hormone, strigolactone, regulates auxin transport, and regulation of auxin transport is necessary for modulating bud outgrowth (Bennett et al., 2006). Analysis of max mutants revealed that branching inhibition is partially dependent on the MAX pathway and the inhibition agent is transmitted across the stem from the active to the inhibited branch (Ongaro et al., 2008). In our study, we found CCD8 to be significantly downregulated in AGL79KD mutant, suggesting the potential existence of a regulatory relationship between AGL79 and CCD8, and the involvement of AGL79 in regulating shoot branching in Arabidopsis. AGL79 also plays a role in regulating Arabidopsis leaf shape. 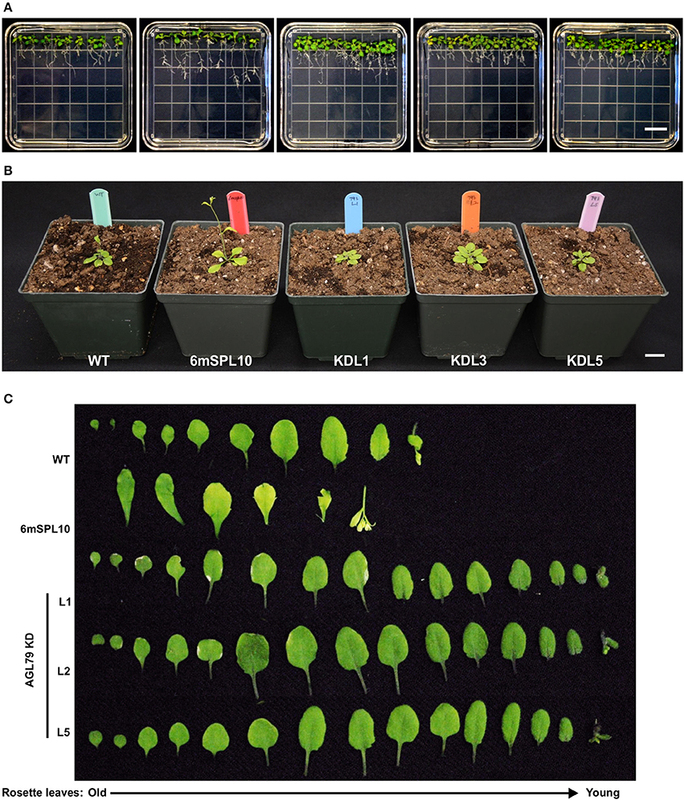 High AGL79 transcript levels altered leaf lamina shape in the AGL79OE plants, which was similar to the effect of SPL10 overexpression (Figure 4D). During leaf development, PIN1 and KNOX1 are known to regulate leaf initiation, HD-ZIPIII, KANADI, and YABBY mediate leaf outgrowth, and ANGUSTIFOLIA3 and GROWTH-REGULATING FACTOR5 specify leaf expansion and maturation, while APUM23 is also critical for determining leaf polarity (Dkhar and Pareek, 2014). It remains elusive whether AGL79 and SPL10 determine leaf shape in concert with the afore-mentioned plant leaf shape determination factors. AGL79 may play a role in regulating Arabidopsis flowering through regulation of flowering time-related genes. The regulatory pathway of flowering transition is mediated by CONSTANS (CO), which activates the expression of FLOWERING LOCUS T (FT) (Takada and Goto, 2003; An et al., 2004). At the meristem, FT physically interacts with the bZIP transcription factor FD, and the FT/FD complex in turn activates SOC1 expression (Michaels et al., 2005). In addition, SOC1 and AGL24 can form a positive feedback loop and these two factors may also form a complex to upregulate LFY expression. AP1 and LFY are found to be critical for upregulating the floral meristem identity genes. In addition, SVP regulates flowering time by negatively controlling the expression of floral integrator FT (Lee et al., 2007). In our AGL79KD Arabidopsis mutant plants, two tested flowering time-related genes SOC1 and SVP were silenced, whereas AGL24 was upregulated. This inverse correlation suggests that AGL79 may play a role in regulating Arabidopsis flowering. One interesting observation was that the phenotypes of AGL79 overexpression plants were AGL79 dose-dependent. Generally, there were three major groups of phenotypes resulting from different levels of AGL79 expression: high (group 1), moderate (group 2) and low (group 3). The change in some phenotypes from group 1 to group 3 was gradual, such as with an increase in number of rosette leaves and shoot branches, but with decreasing days of flowering time. In group 1, we noted that AGL79 gene transcript level was lower in the root tissue compared to that in the leaf tissue, which is contrary to WT where AGL79 is mainly expressed in the root rather than the leaf. One possibility is that it is difficult to further overexpress AGL79 gene in the roots, because the already high expression of the endogenous AGL79 gene in this tissue (due to feedback regulation) prevents excessive overexpression of the transgene. Another possibility is that AGL79 may play a dual role of acting simultaneously as an activator of leaf shape development in the leaf tissue and a repressor of lateral root development in the root tissue. The first identified WUSCHEL protein in Arabidopsis is a repressor of genes involved in the maintenance of stem cell population in shoot meristems and also an activator of AGAMOUS, which is involved in floral patterning (Ikeda et al., 2009). Arabidopsis FILAMENTOUS FLOWER, which controls lateral organ development, functions as an activator in regulating leaf patterning and a repressor to negatively regulate FIL-response genes (Bonaccorso et al., 2012). It is also possible that the observed AGL79 overexpression phenotype might be due to dosage-dependent gene ectopic effect, as AGL79 is barely detectable in WT leaf tissues. In summary, our results suggest that the miR156/SPL10 regulatory pathway is involved in regulating plant lateral root growth by directly targeting and activating the expression of AGL79. By investigating the gain- and loss-of-function AGL79 transgenic plants, we also found AGL79 to be involved in regulating plant leaf shape, shoot branching, and flowering time. Further characterization of the AGL79 gene in other plant species, especially in major crops, will determine how conserved AGL79 is in plants. It can also be tested in crop improvement efforts to enhance resilience and productivity. RG and AH. designed and managed the project; YW conduced RNA-Seq analysis. RG performed experiments and drafted the manuscript. MG and AH provided intellectual input and revised the manuscript. This project was funded by a grant from Agriculture and Agri-Food Canada (J-000260) to AH. RG was the recipient of a NSERC Visiting Fellowship to a Canadian Government Laboratory. Supplementary Figure 1. AGL79 knockout mutant using CRISPR technique. (A) Vegetative morphology of WT and three lines of AGL79 CRISPR Plants (bar = 1.5 cm). (B) Genomic DNA sequence analysis of CRISPR-modified Arabidopsis plants. (C) Detecting AGL79 transcript levels by qRT-PCR in WT and three lines of AGL79 CRISPR Plants. Supplementary Figure 2. Phenotypes of a batch of 6mSPL10 plants (bar = 1.5 cm). Supplementary Figure 3. Selected genotyping results from plants of (A) spl2spl10 double mutant and (B) AGL79 OE. Supplementary Table 1. Differentially expressed genes between WT and miR156OE Arabidopsis plant roots. Supplementary Document 1. The 2,000 bp upstream promoter region of AGL79 gene. Supplementary Document 2. The sgRNA locations within the AGL79 ORF and genomic sequences. Copyright © 2018 Gao, Wang, Gruber and Hannoufa. This is an open-access article distributed under the terms of the Creative Commons Attribution License (CC BY). The use, distribution or reproduction in other forums is permitted, provided the original author(s) or licensor are credited and that the original publication in this journal is cited, in accordance with accepted academic practice. No use, distribution or reproduction is permitted which does not comply with these terms.